1. French is an international language. French is spoken in 68 states and governments and spoken and understood by over 200 million people around the world. 2. There are many job opportunities for bilingual people who speak French and English both at home and abroad. You can work in many different countries including Canada, Switzerland, Belgium and parts of Africa. 3. French encompasses the arts and many other cultural aspects such as music, literature, art and cooking. 4. French is perfect if you plan to travel as France itself is a marvellous travel destination, but French is also spoke in several other destinations throughout Europe, Canada and Africa. 5. Speaking French opens up doors of higher education allowing you to benefit from French courses in cooking, music and the arts. 6. French is considers an official language for many prominent associations and federations including The United Nations, The European Union, UNESCO, NATO and the The International Olympic Committee. 7. French is the third most commonly used language on the Internet second only to English and German. 8. French is a relatively easy language to learn which means you can start communicating in French quite quickly. 9. French is considered a romantic language due to its lyrical sounds, but it is also an analytical language that helps to develop critical thinking. 10. There are many improved learning techniques that make learning French fun and engaging. Whether you are an adult or a child, French is a perfect language to start you on expanding your foreign language skills. We believe learning a new language should be fun, engaging and challenge your mind to want to experience new things. 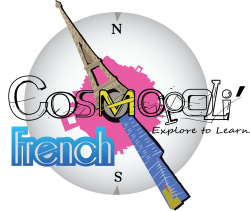 Contact Cosmopoli’French to set your mind on a course a new and exciting journey of learning.